The record is made up of 1 volume (55 folios). It was created in 1918. It was written in English. The original is part of the British Library: India Office The department of the British Government to which the Government of India reported between 1858 and 1947. The successor to the Court of Directors. Records and Private Papers. PRINTED AT THE GOVERISljMENT MONOTYPE PRESS. The volume is Mesopotamian Transport Commission. 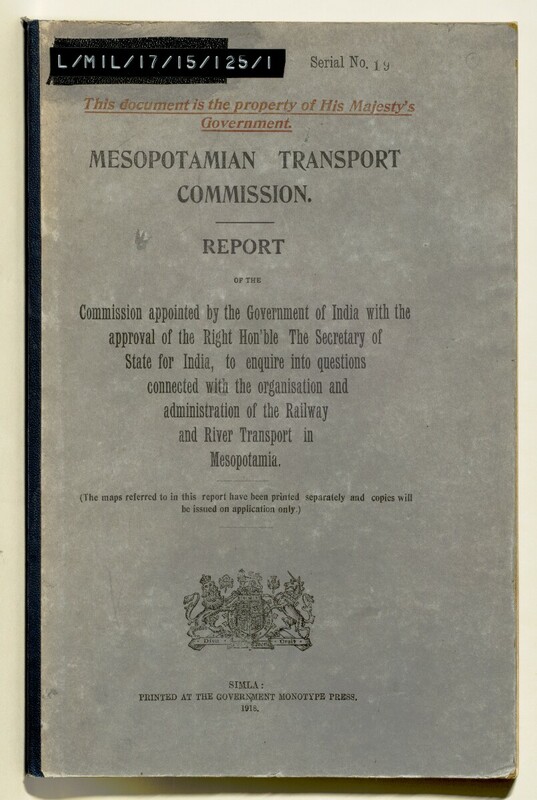 Report of the Commission Appointed by the Government of India with the Approval of the Right Hon'ble The Secretary of State for India, to Enquire into Questions Connected with the Organisation and Administration of the Railway and River Transport in Mesopotamia (Simla: Government Monotype Press, 1918). (1) Are the Railway and Inland Water Transport Directorates in Mesopotamia organised and adminstered on systems which ensure the most economical utilization of the labour - both skilled and unskilled - supplied to them consistent with efficiency and military considerations? If not, what changes in organisation and administration are recommended? (2) Is Mesopotamia receiving its due share of personnel consistent with the claims of railways, shipping and manufacturing interests in India? (3) Applying the considerations mentioned in (1) is the organisation of Railways and Inland Water Transport in Mesopotamia such as to ensure that: (a) Excessive stocks of materials are not held; (b) Demands from the various Directorates are co-ordinated; (c) Machinery and tools and plant in workshops and elsewhwere are utilised to the maximum extent. Commissioners: Major-General H F E Freeland (Chairman); Mr E A S Bell; Mr G Richards; Mr A J Chase (Secretary); Mr James E Roy; Captain E F Daldy, RNR. The volume also contains appendices on inland water transport; railways; and local resources. There is a table of contents on folio 4, which also includes a list of the maps in Volume 2 [IOR/L/MIL/17/15/125/2]. Foliation: the foliation sequence commences at 1 on the front cover and terminates at 57 on the back cover. The numbers are written in pencil, are enclosed in a circle, and appear in the top right hand corner of the recto The front of a sheet of paper or leaf, often abbreviated to 'r'. page of each folio. This is the system that has been used to determine the order of pages. Pagination: there is also an original printed pagination sequence, numbered 2-100 (ff 6-55).